WASHINGTON, D.C. -- More than 4 million Afghans braved the threat of Taliban attacks on polling places to vote in last weekend's parliamentary elections. The turnout reflected a steely resolve amid the climate of fear and lack of confidence in the country's security forces created by continuous and widespread Taliban attacks in recent months. It also speaks to a longing among many Afghans to have a voice in shaping their futures. Gallup's most recent survey of Afghans, conducted last July, revealed strikingly low levels of optimism and well-being across a range of indicators. Afghans' ratings of their own lives are lower than any other population's worldwide. Asked to rate their current lives on a ladder scale where "0" represents their worst possible life and "10" their best possible life, Afghans give an average rating of 2.7 in 2018, down from 4.2 in 2016. The current figure is in fact tied for the lowest Gallup has recorded in any country since it began tracking these measures in 2006. Asked to predict where their lives will be in five years on the same scale, Afghans' average response is 2.3 -- a new low for any country in any year. Afghans' 2018 life ratings are remarkable not just for the very low averages, but because this is the first time in 12 years of data collection worldwide that a population's average prediction for life in the future has been lower than its average current-life rating. The unprecedented nature of that finding highlights Afghans' near-universal lack of optimism -- a finding that is all the more notable given the population's very young age structure: two-thirds of adults interviewed for the statistically representative 2018 survey are aged 35 or under. Afghans also give extremely negative responses using another common approach to measuring well-being which asks people about the quality of their day-to-day experiences and emotions. This year, 36% of Afghans say they smiled or laughed a lot the previous day, down from 52% in 2016; the figure matches the lowest Gallup has recorded in any country over the past 12 years. Conversely, 52% of Afghans currently say they experienced worry for much of the previous day, up from 42% in 2016. In addition, the proportion of Afghans who say they experienced enjoyment and who say they were treated with respect the previous day both fell below half (48%) for the first time in 2018. The current historically low well-being results reflect the suffering of a people with very little control over their own destinies. Afghanistan's infrastructure -- including its healthcare and education systems -- is spotty and unreliable after decades of conflict. The country has one of the world's lowest literacy rates, at 31%, giving residents little opportunity to improve their economic status. In 2018, 57% of Afghans say there were times in the past year when they didn't have enough money to buy food for themselves or their families, and 50% say there were times when they didn't have enough money to pay for shelter. 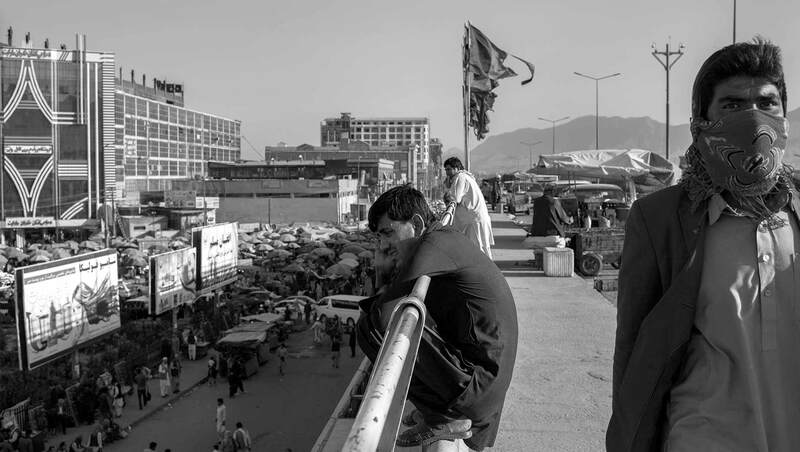 Almost no Afghans see their economic situation improving anytime soon. 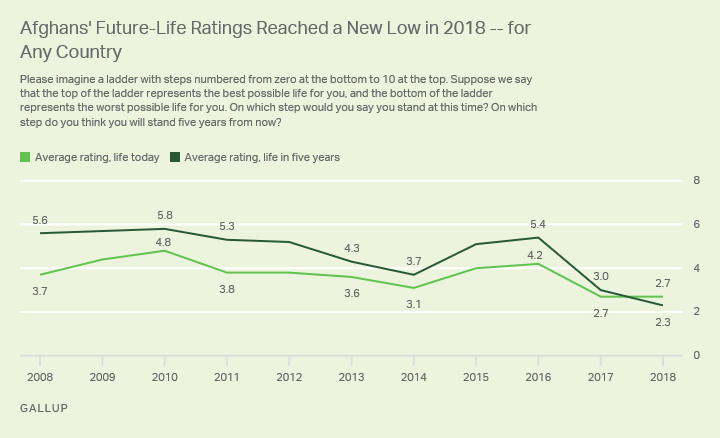 This year, 4% say their standard of living is getting better; this is lower than or on par with the lowest figures Gallup has recorded from any country since 2006, including the most desperately poor countries in Africa and Asia. Seven percent of Afghans say their standard of living is staying the same, while 52% say it is getting worse. Gallup's 2018 survey in Afghanistan reveals just how devastating the negative cycle of poverty and violence has been to Afghans' daily experiences. Two of the most fundamental human requirements -- physiological needs like food and shelter, and the need for safety and security -- are consistently lacking in their lives, leading to alarmingly low levels of hope and well-being. As many analysts have noted, given the country's current status, there are no good options for resolving U.S. and NATO involvement in Afghanistan. In considering any new strategy, however, policymakers should not lose sight of the truly desperate situation the Afghan people find themselves in. Results are based on face-to-face interviews with approximately 1,000 adults per year, aged 15 and older, conducted 2008-2018 in Afghanistan. For results based on the total sample of national adults, the margin of sampling error is ±3.8 percentage points at the 95% confidence level. As Taliban attacks attempt to sow fear ahead of Saturday's parliamentary elections, Gallup finds that a record-low 13% of Afghans feel safe walking alone in their area at night. 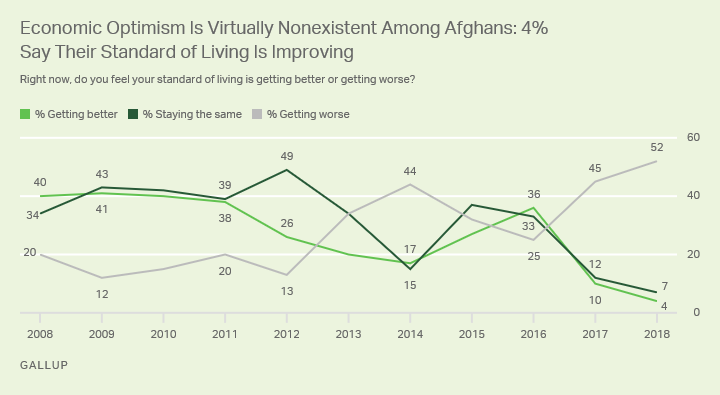 As the international combat mission in Afghanistan ends, 61% of Afghans rate their own lives poorly enough to be considered "suffering" -- the highest figure Gallup has ever recorded for any country. Afghans' outlook on their economy shows that the Taliban are not the only threat to the country's stability after NATO's withdrawal. The percentage of Afghans seeing economic conditions as improving sank to a record-low 6% in 2014. Is the World Really as Dangerous as We Think? Counter to what people might read, see and hear on the news, Gallup's global polling shows the majority of people on the planet feel pretty safe.